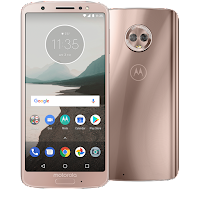 The Google Project Fi team has announced that the Motorola Moto G6 is now available in two colors on the network. A new 'blush' color has now joined the black variant on the Project Fi website. The Motorola Moto G6 is a mid-range Android smartphone, featuring a 5.7-inch edge-to-edge display, dual (12MP+5MP) rear cameras, an 8MP front camera, 32GB of internal storage, a 3000mAh battery, quick charging and a Snapdragon 450 CPU with 3GB of RAM. The Moto G6 is being offered with a $50 discount on Project Fi, bringing the final price down to $199 or $8.29 per month for 24 months. If you chose to trade in your existing phone, you may be able to get the Moto G6 for free.